President Bush appeared before the Indiana Black Expo on Thursday to make the case that his policies are giving minorities a boost. "Because of sound policy and low taxes, by the way, and the hard work of our citizens, we're getting results: African American business ownership is at an all-time high in America today," Mr. Bush said. His appearance provided political cover for Mr. Bush, who for the fifth year in a row turned down an invitation from the NAACP. The White House said again that he couldn't attend because of a scheduling conflict. The president got a friendly reception from the Black Expo audience, though some protesters outside accused the group of selling out by inviting Mr. Bush to speak, reports CBS News White House Correspondent Mark Knoller. The president said he believes in an America where all people, including blacks, have the chance to own homes and businesses and share in the country's prosperity. He also took credit for narrowing the gap in test scores between black and white elementary school students, according to test results released Thursday by his Education Department. "I see an America where every citizen owns a stake in the future of our country and where a growing economy creates jobs and opportunity for everyone," the president said, his voice echoing in the cavernous RCA Dome, where more than 3,000 people packed luncheon tables on the floor below empty stands. White House press secretary Scott McClellan said the president agreed with Mehlman, even though the president didn't express any regrets during his speech in Indiana. Mehlman also was trying to persuade blacks — who vote overwhelmingly Democratic — to switch political alliances. He said Democrats have been taking blacks for granted in recent years. "It's not healthy for the country for our political parties to be so racially polarized," he said. "Just as the Democrats came to this community in 1964 with something real to offer, today we Republicans have something that should cause you to take another look at the party of Lincoln." Mr. Bush touted his efforts to improve education, health care and Social Security and to increase aid to Africa and religious organizations that provide social services. 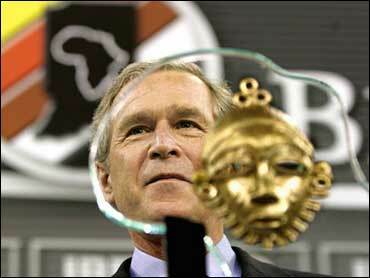 The group presented Bush with a lifetime achievement award, citing his efforts to help former prisoners become productive members of society and other programs benefiting minorities. "I see an America where every person of every race has the opportunity to strive for a better future and to take part in the promise of America — that's what I see," Mr. Bush said. "And I believe the government has a role to play in helping people gain the tools they need to build lives of dignity and purpose," he said. "That's at the heart of what I call compassionate conservatism." Republicans made a similar pitch for black votes in last year's campaign, but Mr. Bush received just 11 percent of the black vote. Mr. Bush has not spoken to the NAACP since the 2000 campaign, when the NAACP National Voter Fund ran an ad that portrayed him as unsympathetic to the dragging death of James Byrd in Texas. Many blacks, especially in the pivotal state of Florida, complained they were disenfranchised by confusing ballots and mechanical errors. Since then, NAACP officials have called Mr. Bush an illegal president, compared his anti-abortion views to the Taliban and called his trip to Africa a photo-op. The Internal Revenue Service is investigating whether NAACP officials' attacks on the Bush administration are partisan comments that violate the group's nonprofit status. The NAACP's national board last month selected a new president, retired Verizon executive Bruce S. Gordon, who is expected to be confirmed Thursday and has pledged to build relationships with the White House. McClellan said that he was sure Mr. Bush would find time to sit down for a talk with Gordon.